The first two are a must. The last one isn't worth chasing you over unless you take full credit for the lot. One artist got into a lot of trouble when she started selling items (t-shirts and mugs, etc,.) based on Harry Potter using characters she created herself. Because she had not asked for permission, she was sued and had to take her website down. If she had stuck to fanfiction, she would have been fine because people who like the fanfic will often go and buy the source material so they can write their own. 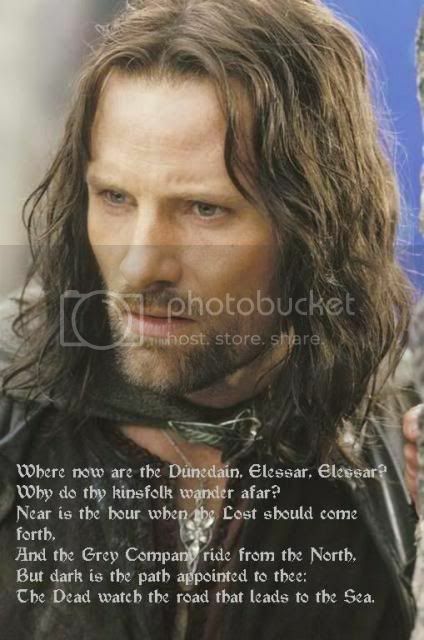 That's what started off my LOTR addiction -- first the movies, then fanfiction. I bought the books later on. I didn't look. If you want to hide stuff from the general public, there is a friends-only option. Have you clicked on that? It's not the default. People will only be able to view stuff in your private collection if they have the link or are friended to you. I haven't been able to find the friends only option, but I vaguely remember when I first set the account up that I hit every private button I could find! The whole set-up looks different now. That copyright info is good to know. I'll put the other slide show on Photobucket so you can see it too. It's more romantic. Oh thanks, Candy! I do have it set to Private, go me! I tried to upload my slide show to Photobucket but apparently there is copyrighted material on it and it won't do it. My bad. I did use someone else's wallpaper and some music, although I credited the music. I don't know who made the wallpaper. 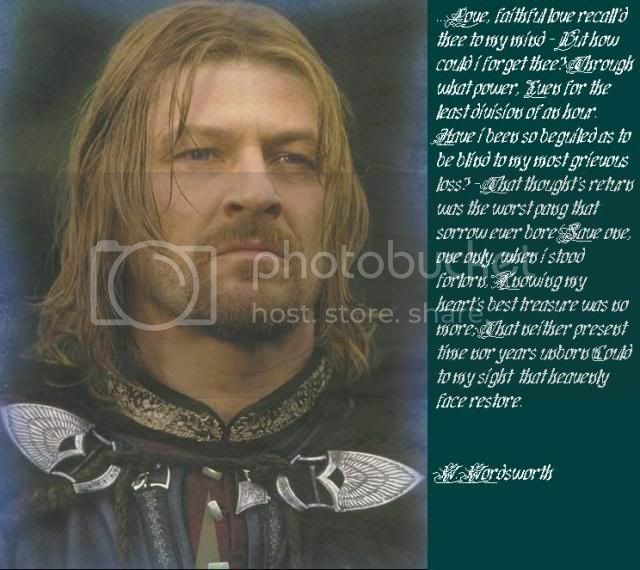 The rest of it is just more screencaps from LotR though. I don't know how else to post it. Oh well. We tried! We did indeed. If you post links here, members will be able to see them. As for copyrighted wallpapers, do you know how to make your own? I can make some for you if you like. I think I'm okay with wallpapers, but thank you for the offer! If I want one with moving pictures, I'll get you to make one, or you can teach me how. I didn't know about RB until March, so I haven't had the pleasure of Passo's acquaintance, but I'd be happy to make graphics for you. It's tremendous fun. The tutorials are pretty good. I'm a bit boring, though -- I tend to stick to a few basics, and that's it. I see Passo has signed on here at the new RB but doesn't appear to have ever posted. I know she's very busy with other things so maybe she decided to retire her position here. Do you do computer work and writing for your living? What a ton of fun, if so! I've been an at-home mom while my kids were at home but they're grown now. My son is on his own, and our daughter is still at home but she's 22. Now I'm in charge of caring for my 93 year-old Mom and am still at-home. I've taken up dabbling in art for two reasons: 1 to see if I had any of my Dad's artistic genes, and 2 to keep from going nuts! It's fun learning all this stuff though, and I do mean to tackle GIMP at my first opportunity and play with it. We'll have to compare notes! Vairë wrote: Do you do computer work and writing for your living? What a ton of fun, if so! I wish! But it's what I want to do. I've been an at-home mom while my kids were at home but they're grown now. My son is on his own, and our daughter is still at home but she's 22. Now I'm in charge of caring for my 93 year-old Mom and am still at-home. Wow! That's a lot of commitment. One of the things I like best about RB is that the people here are my age. I've taken up dabbling in art for two reasons: 1 to see if I had any of my Dad's artistic genes, and 2 to keep from going nuts! It's fun learning all this stuff though, and I do mean to tackle GIMP at my first opportunity and play with it. We'll have to compare notes! We will. I'd really like that. 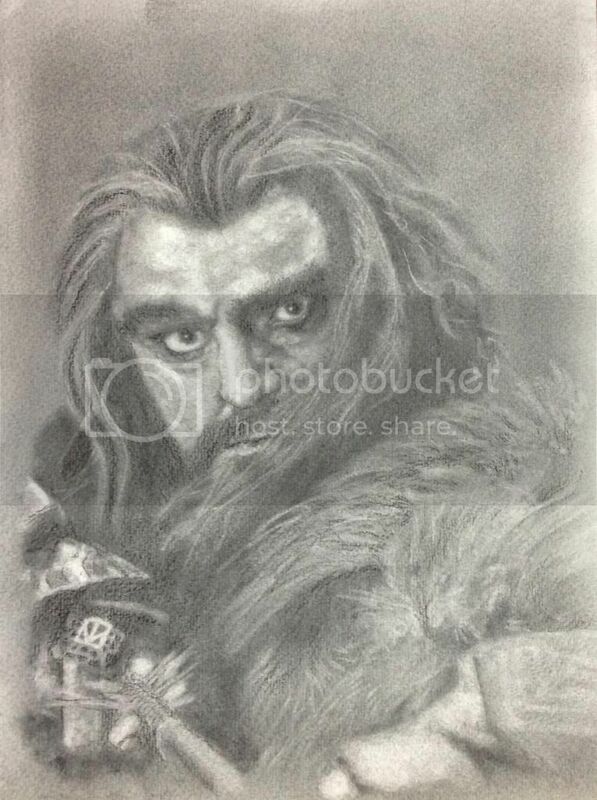 Thought I'd post a drawing I did of Thorin. Hope you all like it! Thank you, Candy! Sorry it posted so big - I didn't expect it would. Worry not, it's not too big.